Last weekend I was lucky enough to attend the opening night of The Attaining Gigantick Dimensions and somehow managed to get there on time and get great seats (so unlike me). The Attaining Gigantick Demensions is a must see performance! Zuppa Theatre Co. manages to take a profoundly sad topic (death) and still allow for a brilliantly funny comedy. I both laughed and cried at the actors sincere and honest performance. Synopsis: Created with Cleveland-based playwright Mike Geither, The Attaining Gigantick Dimensions follows a military translator as he returns to Halifax from Afghanistan with news of a family crisis. But then ordinary life happens: he revisits old haunts, catches up with family and friends, meets a schoolteacher from Texas and buys a new shirt. Framed by the trauma of large-scale conflict on one side, and personal loss on the other, unremarkable events take on great significance. The Attaining Gigantick Dimensions is a poetic, visually arresting theatrical mediation on life’s “spaces in between”. What is absolutely noteworthy in this play is the visual projections that were incorporated into the performance (as seen in the photo above). 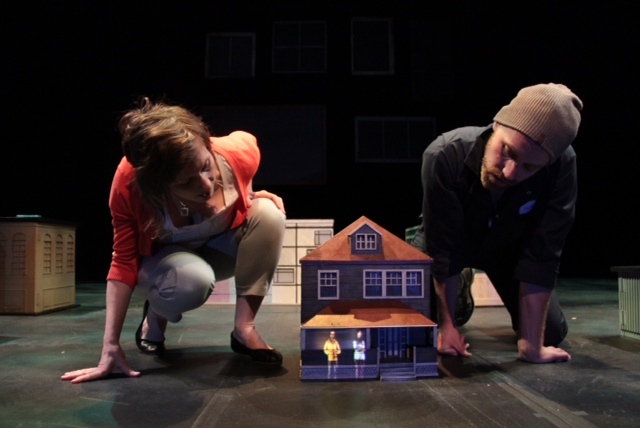 The set was a series of small buildings (actual replications of buildings in the North End of Halifax) that allowed for projections to be displayed both in the windows of the buildings as well as on the buildings themselves. The back wall of the set is a collage of photos that later display live images and footage. The back wall at one point displayed only projections of eyes which felt vaguely reminiscent of Warhol’s “Factory”. I don’t want to spoil it for you, but the time and effort that must have gone into creating those images, and projections must have taken some serious dedication. I especially liked the scene where the four actors visited Peggy’s Cove, a very popular tourist attraction for Nova Scotia. With the sound effects of loud waves crashing, and the muffled conversations of the actors I actually felt like I was at the Cove with them. When chatting with one of the actors (Susan) after the play she mentioned that underneath the stage there were sub-woofers, and so she could feel the vibrations of sound beneath her feet, and so she too felt like she was there at Peggy’s Cove with the ocean at her feet. It is always interesting to me how creative people can be in recreating scenes, and creating settings for plays, I especially think Zuppa Theatre did a really great job of performing to multiple senses. This was my first Zuppa Theatre experience and I had heard that they do some pretty interesting things with movements in their performances, and so being a dancer myself I was quite interested in seeing what it was all about. A couple of scenes really stuck out to me, but one that I found particularly interesting was shortly after the brother (Frances, played by Ben Stone) had just gotten home from his traumatic experience in Afghanistan only to find out that his father is terminally ill. Overcome with sadness and grief there’s a scene in the play where Frances is discussing this with his friend Martin (a very sweet and quite innocent lad played by Stewart Legere) and as he’s talking he slowly turns around in a circular motion. For me the moment here was particularly interesting because I felt like it was symbolic to the expression of his feelings. The more Frances talked about how he felt about his sadness the more he spun around, and it was almost as if he was caught in a downward spiral or that his emotions were that of a tornado. Maybe my English Major mind was reading too much into the moment, but I certainly felt like it suited the subject matter and really contributed to the overall themes in the play. It’s these little things I think that make Zuppa Theatre a special experience. Show times: April 12 – 21, 2013 – 8:00pm (No performances Monday or Tuesday). The Attaining Gigantick Dimensions is profoundly sad, but equally hilarious. Job well done Zuppa Theatre; it was a brilliant performance both visually and auditorily. Do yourself a favor blog reader and give it a go!